STDM 1.4 is a full release which includes enhanced functionality and stability improvements. One special highlight is the complete redesign of the database customization module; this not only improves the stability of the system but also allows more data types to be defined by the user. The following sections summarize changes in different functional areas of STDM. The following sections summarize changes in different functional areas of STDM. The configuration backend has been redesigned to be more stable and extensible. 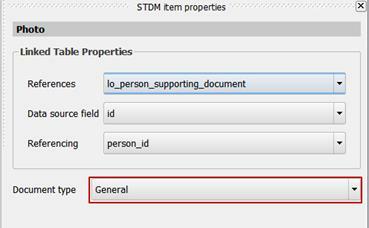 This has opened up the possibility of customizing the tool further based on the data requirements of the specific application context; these new features are highlighted below: Data Profiles STDM now supports the definition of one or more data profiles. A data profile represents a logical set of interrelated tables for a specific application context of STDM. For example, an informal settlement profile can contain tables representing household, structures, household members, priority projects, etc. whereas, a rural agriculture profile can include information pertaining to a farmer, garden, productivity and socio-economic impacts. For each data profile, STDM implicitly creates a social tenure relationship whose types are user-defined depending on the application context e.g. tenancy, ownership, leasehold, farming. The default installation is shipped with three basic data profiles which can either be customized by the user, deleted or new ones created from scratch. For each new entity, there is now an option for enabling supporting documents to be attached to a record. By default, this is automatically enabled for new social tenure relationship definitions. 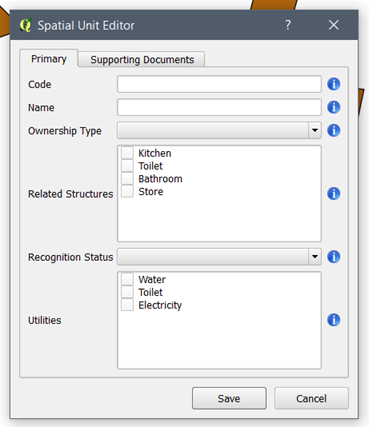 For each entity with supporting documents enabled, a user-defined set of document types can also be specified. Administrative Spatial Unit – Specifies a particular location within a custom administrative unit hierarchy. This can be applied, for example, when attaching place of birth, previous residence, place of work, etc. from a preset list of location names. Multiple Select Lookup – For specifying the selection of one or more choices from a preset list. For instance, when defining income sources for a person or household, the options can be business, employment and/or from spouse. Related Entity – For specifying one-to-many relationships between entities. 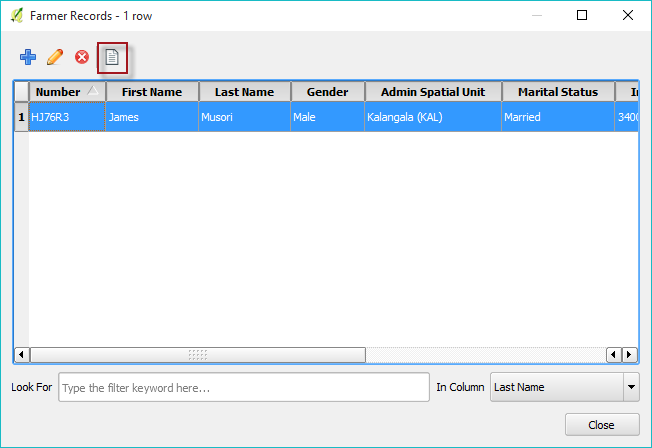 For instance if a data profile has both ‘household’ and ‘household members’ entities, then a new column can be added to the ‘household members’ entity thereby enabling ‘household members’ to be linked to the ‘household’ that they belong to. Unlimited Text – Used for specifying free-form text that has no constraints on the length of characters. Yes/No– For specifying a Yes/No column. This appears as a checkbox in the forms. Date with Time – Used for specifying date with time. 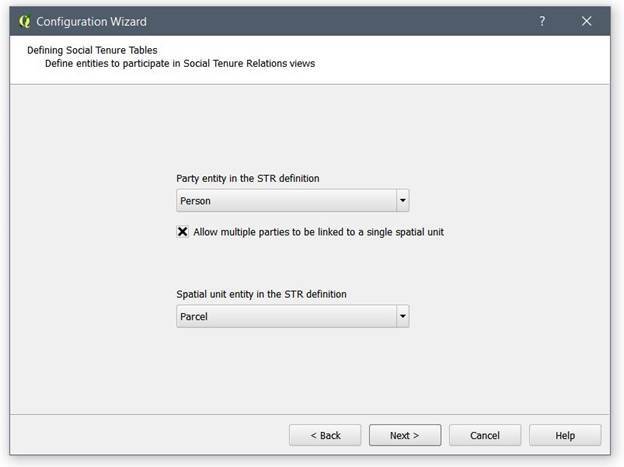 A check constraint can now be applied to limit a single party to one spatial unit when defining a new social tenure relationship otherwise by default, multiple parties are allowed to be linked to a single spatial unit using the ‘new social tenure relationship’ module. The configuration module has been simplified to automatically update the database by first checking existing tables and updating them accordingly thereby removing the options of creating new or updating existing tables, as was the case in the previous versions. 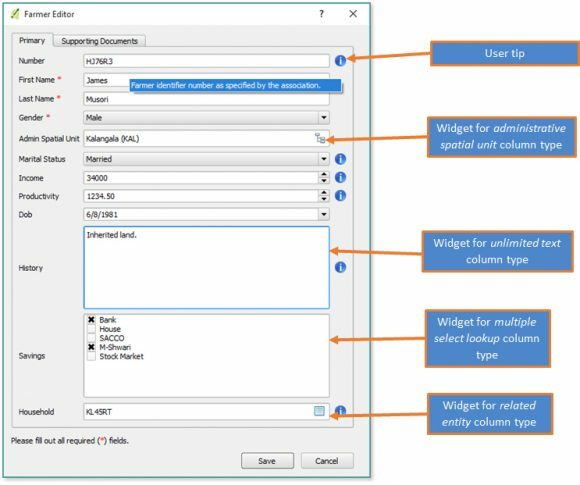 The forms are more intuitive with the option of specifying user tips for each data entry widget. Similarly, supporting documents can be easily uploaded for each entity based on the document type. For those entities that allow supporting documents to be uploaded, the entity browser has an additional toolbar item for viewing supporting documents for a selected record. The Entity Browser of a spatial unit or any other entity is now accessible in the Entities menu. 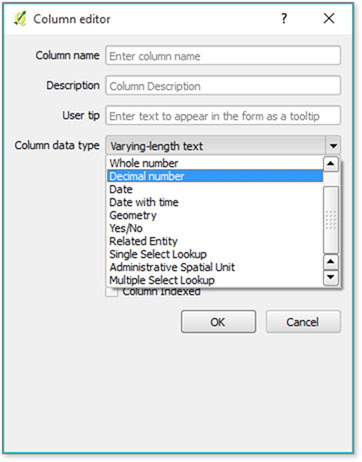 This enables the user to edit, delete and view document of a spatial unit record. In addition, by single selecting a record, the user can preview the record’s geometry in QGIS Map Canvas as shown below. 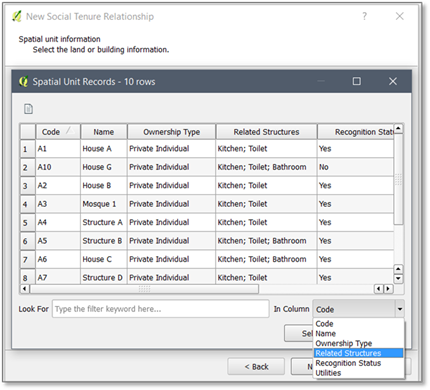 Multiple parties can now be linked to a single spatial unit (applicable if this option has been enabled for the current data profile). 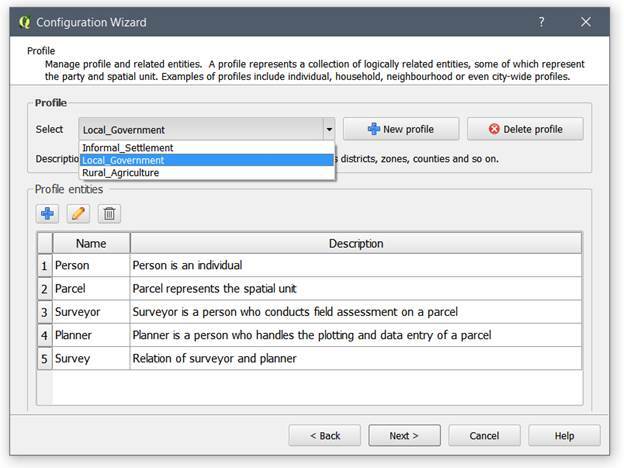 A spatial unit can now be selected using any criteria e.g. name, code, use type etc. 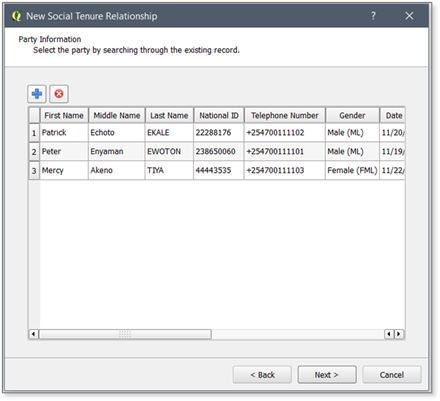 The tenure type can now be easily specified for each selected party. 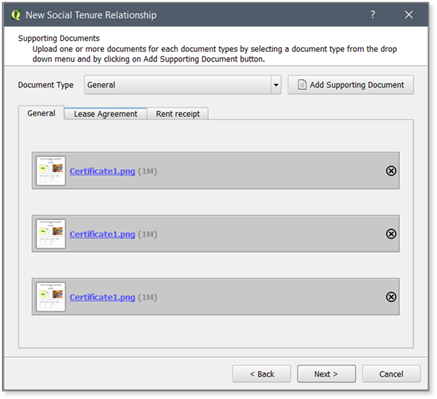 Supporting documents for social tenure relationships are now grouped based on the document type. 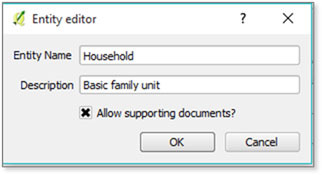 When assigning multiple party for one spatial unit, a copy of supporting document is created for each party. 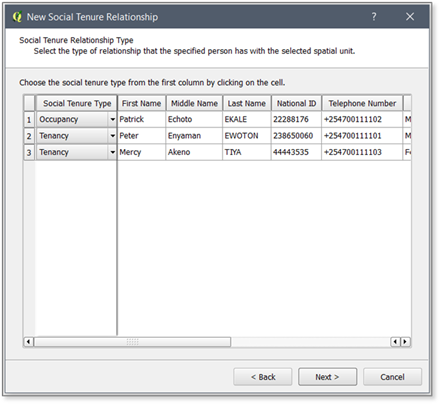 Existing social tenure relationship records can be edited from the selected search using the New Social Tenure Relationship wizard. This gives more flexibility in modifying the person, spatial unit, social tenure type, and supporting document for the selected Social Tenure Relationship. Editing attribute data related to a spatial unit. 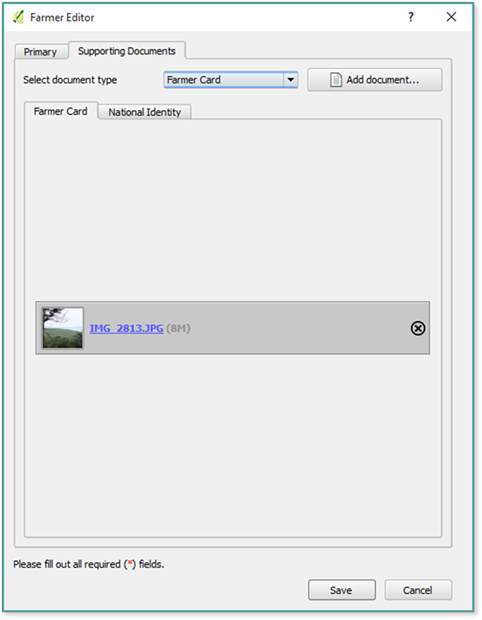 Images can now be added to the document layout based on a specific document type. If an entity supports, say, four different types of documents then four separate image composer items (corresponding to each document type) can be added to the layout and configured accordingly. Reports can be generated for all primary entities in the current profile regardless of whether they participate in the social tenure relationship or not. This provides more flexibility for generating individual or aggregate reports for all data-sets managed by STDM. 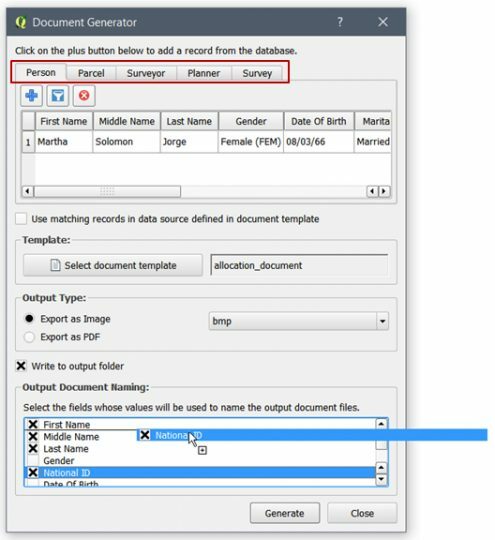 Output document naming fields are ordered as they are created in the Configuration Wizard and they can be sorted by drag and drop as shown the bottom of the image below. 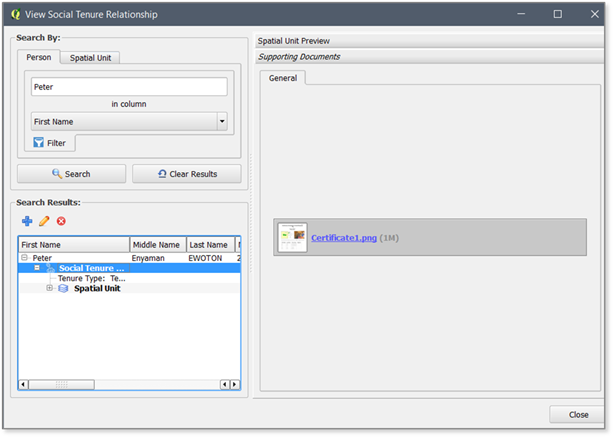 Using the value translator framework, supporting documents can now be imported for each record by specifying the document path in the module and the file name in the csv file. 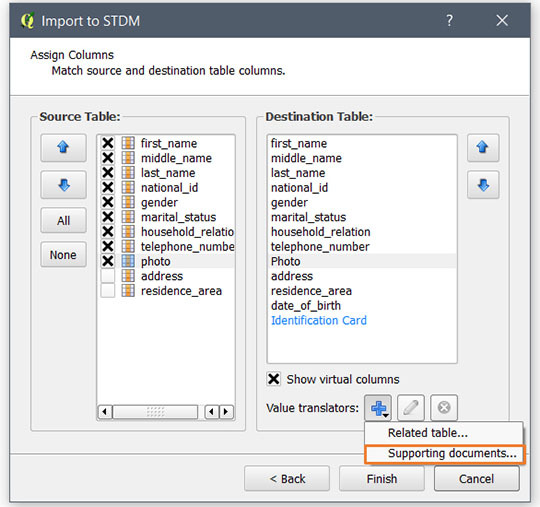 Migration from the previous versions of STDM is seamless. 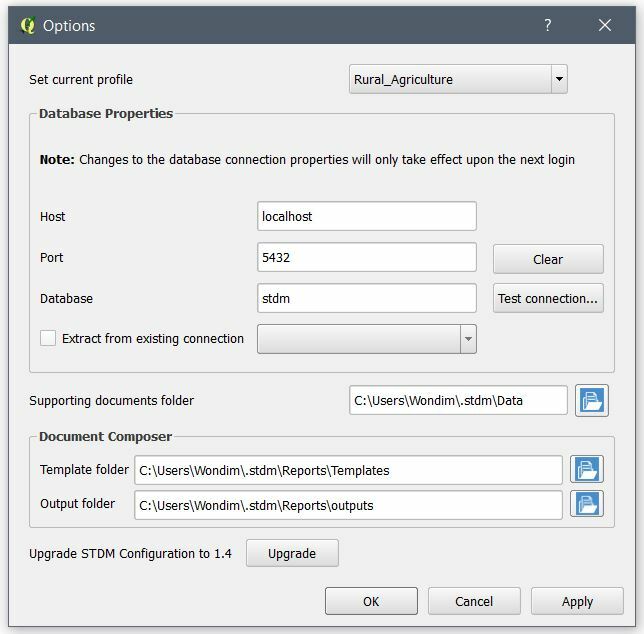 For existing installations, the upgrade of STDM is done through the QGIS Plugin manager; that notifies the user to upgrade to the new version. 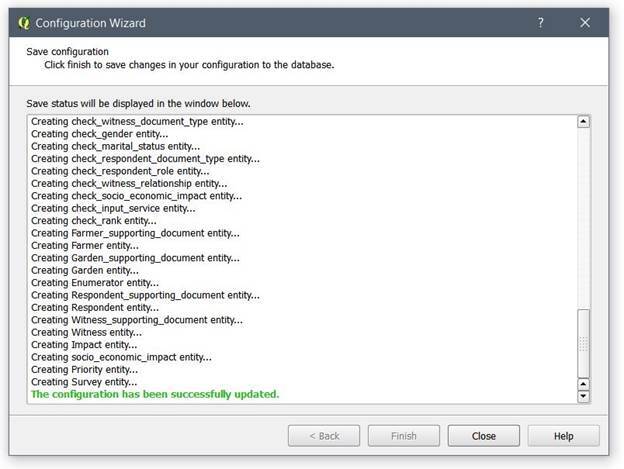 Then a configuration and data migration is done through the new Upgrade module. It is accessible on the first time login and from the Options module. Note: This only works for STDM v1.0 and v1.1. The logical flow of the user manual has been greatly improved by incorporating more illustrations and use-case examples.